Keratosis pilaris is a genetic disorder which appears as tiny and red/white bumps on the skin. It is commonly referred as chicken skin because of its appearance. Keratosis pilaris is completely harmless and not contagious but people having this skin condition often feel emotional distress. It is a genetic disorder in most of the people. The tiny bumps are formed when the hair follicle is clogged by excess production of keratin protein. It may get cleared or worsen spontaneously with or without treatment. Dry skin worsens the tiny bump’s appearance. In fact, for many people, keratosis pilaris gets almost cleared in summer months and worsens in winter months. Generally, the skin condition improves as the person grows older but for some people, it may persist for many years. Ointments and medicines are prescribed but natural remedies for treating keratosis pilaris have proven to be more beneficial in healing the symptoms to maximum extent. Moisturizing is one of the main treatments for getting relief from keratosis pilaris. This can be achieved with the super moisturizing properties of olive, oatmeal and coconut oil. Is Olive Oil Beneficial in Treating Keratosis Pilaris? Olive oil is rich in vitamin E which reduces the tiny bumps and rejuvenates the damaged skin. It helps our body to get rid of excess keratin and provides quick healing. It moisturizes the skin and prevents getting it dry. 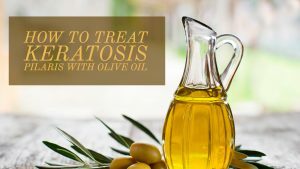 How to Use Olive Oil for Keratosis Pilaris? There are many ways of incorporating olive oil into your daily life to get relief from keratosis pilaris. We have mentioned them below in detail. This process should be the most important part of your daily regiment if you want to get relief from keratosis pilaris. Slather enough amounts of olive oil on the affected areas. Note: Don’t apply too much of oil as it can leave you greasy. The mild abrasiveness of salt helps to get rid of bumps, accumulated dead skin and unclogs the pores while olive oil moisturizes to prevent the dryness. Combine 2 tablespoons of olive oil and 3 tablespoons of salt. Stir well and apply the mixture to the affected areas. Gently massage in a circular motion for few minutes. Repeat the 2 times a week. Just like the above method, the abrasiveness of sugar helps to unclog the pores and reduce the chicken skin. Sugar also locks the moisture in skin cells which prevents the dryness. Mix enough amounts of olive oil and sugar. Add a little warm water (optional) and stir well. Apply the solution to the affected areas. Gently scrub for few minutes and leave it for another few minutes. Repeat the 2 – 3 times a week. Alternatively, you can use brown sugar or cane sugar instead of white sugar. Combine 2 tablespoons each of sugar and olive oil. Add 1 teaspoon of honey into it and stir well. Apply the result to the affected areas. Gently scrub for few minutes and rinse off with water. Oil pulling helps to draw out the toxins from the mouth. A good oral health has been proven to successfully manage keratosis pilaris. Combine enough amounts of olive oil and coconut oil. Swish the mixture in your mouth for about 15 – 20 minutes. Spit the mixture out and rinse off with water to removes the traces of oil. Repeat the process daily before brushing and meal. The Salve helps you to reduce the excess production of keratin, moisturizes the skin and heals the damaged skin. You can make and store it for approximately 6 – 8 months. Apart from healing keratosis pilaris, it also works wonders for diaper rash, burns, bruises, itchy skin and eczema. Using a double boiler, melt 4 tablespoons of beeswax and 1 cup each of olive oil and coconut oil. Once melted, add 1/2 teaspoon vitamin E oil and stir well. Remove from the flame and add 8 drops melaleuca oil, 6 drops of lemon oil and 10 drops of lavender oil. Stir well and pour into a glass container. Cover with a paper towel and let it sit for more than 6 hours until it solidifies. Now, close the lid and store it in a cool and dry place. Apply the salve 2 – 3 times a day on the affected areas. Scrubbing and moisturizing are the two steps you should follow regularly to treat keratosis pilaris. Do the scrubbing or exfoliation after bath, rinse off with water and apply natural moisturizer while the skin is still wet. Reapply the moisturizer several times a day or whenever you feel the skin dry. We have provided scrub methods you can try at home in the above methods. You can use olive oil or salve to moisturize the affected areas. By following this process many people have achieved positive results. Use only virgin and cold compressed olive oil. Avoid using chemical based scrubs and moisturizers. Instead use natural scrubs and moisturizer we have provided in the article. Chemicals present in lotions, creams, scrubs and moisturizers worsen the skin condition. Don’t be harsh while exfoliating always be gentle. Harshness can worsen the skin condition and lead to rashes and redness. Avoid scratching the tiny bumps. Avoid exposing the affected areas to excessive heat or sun. Improve your diet by including fresh green leafy vegetables and fruits. Get your skin exposed to early morning sun as vitamin D helps in strengthening your immune system and reduce the keratosis pilaris. Are you going to try olive oil for keratosis pilaris? Feel free to share your experience and suggestions in the comments section below.